Forthglade Complete Meal Grain Free Dog Food (Chicken with Butternut Squash & Veg) is a completely natural grain free food that has been formulated especially for adult dogs with sensitive stomachs or food intolerances. Packed with delicious chicken and vegetables, the food has been made with easily digestible ingredients and can be enjoyed on its own or as a complement to a balanced diet. It has also been combined with essential vitamins and minerals to ensure your dog receives all the nutrients they require. Grain Free – Great for dogs with sensitive digestive systems. 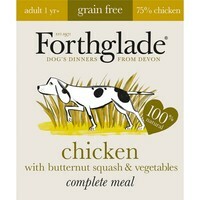 My 3 spaniels love Forthglade food, I mix a small portion with water and add it to their dried food. There is never anything left in their bowls! !